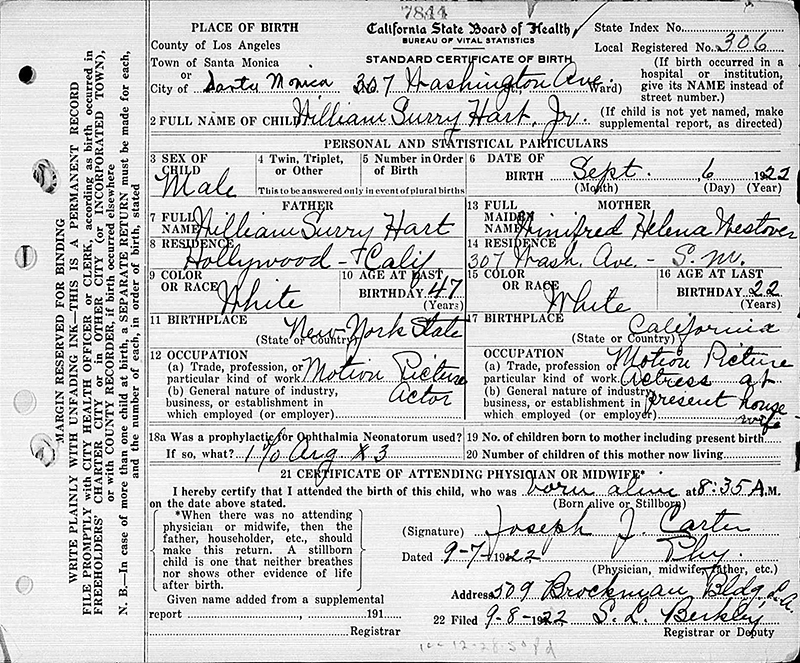 SCVHistory.com LW3335 | William Surry Hart Jr.'s Birth Certificate, 1922. William S. Hart Jr. — Bill and Winifred's only child — went through life with the middle name of "Surrey." But his actual, legal name was William SURRY Hart, Jr. It's all the more interesting because we've never been 100-percent certain about the old man's name. The general consensus is "William Surrey Hart," but there is some speculation that the "S." might not actually stand for anything, á là Harry S Truman. We might never know for sure because Hart's birth certificate is believed to have burned up along with other public records in a big fire sometime before the year 1900 in Newburgh, Orange County, New York, where he was born. The middle moniker is not the only thing Winifred misreported (or did she?) on her son's birth certificate. She reports Bill Sr.'s age as 47. He was 57. It's possible it wasn't her fault. He might have told her he was younger than he was. He told everyone he was younger than he was, presumably for the sake of getting movie roles that called for a younger, more vital man. He NEVER used his actual birth year of 1864 during or after his film career. He said (or wrote) different things in different places, most often 1868, 1871 or 1874. For the sake of Bill Jr.'s birth certificate, Bill Sr.'s birth year would have been 1874. William Surry Hart Jr. was born September 6, 1922, nine months (minus one day) after William S. Hart married Winifred Westover, 22, at his house in Hollywood. Mom and Dad had formally separated May 10, 1922. Bill Jr. was born in Winifred's house in Santa Monica, 307 Washington Avenue. (The house and address apparently no longer exist.) A physician, Joseph J. Carter, attended the birth. LW3335: 9600 dpi jpeg from smaller jpeg. Online only.